Add crispy rice cereal into a large mixing bowl and set aside. In a microwave safe bowl or stovetop, combine all your other ingredients and heat until melted. Remove from microwave/off stove and whisk until completely incorporated. Pour the chocolate/peanut butter mixture over the crispy rice cereal and mix until combined. Pour into the lined baking dish and refrigerate until firm (at least an hour). Remove and cut into bars. This recipe is a favorite of mine. It was very easy, and it it also vegan and gluten free. As you can see there are only three steps and it took a total of 10 minutes to make. Following preparation the bars had to sit in the refrigerator for an hour minimum. Also you can customize this recipe in many different ways by adding whatever ingredient you would like to change the flavor. Since this is a no bake recipe, you don’t have to know how to even turn on the oven and the cleaning process in minimal. 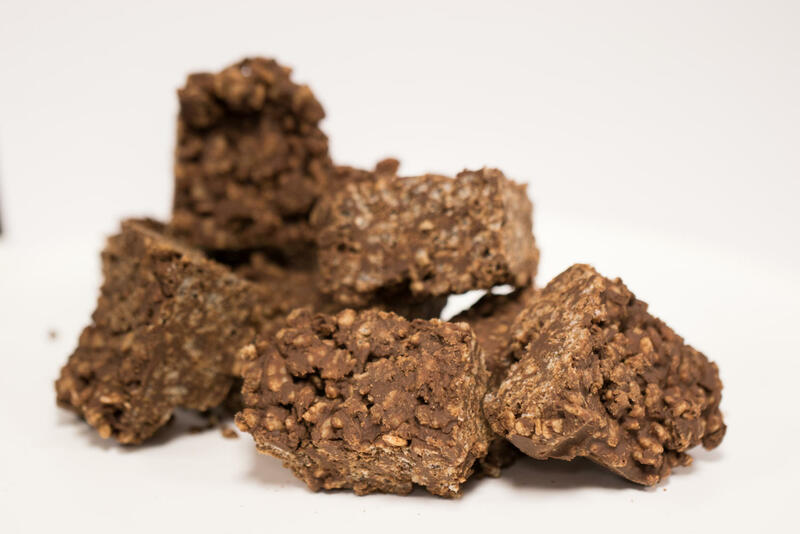 After serving these to my classmates I got overwhelming feedback because most thought that these were like any dessert bars or fudge not knowing they were actually healthy and can be an alternative for desserts containing high amounts of fat, sugar, and gluten.